The Panama Canal strategically links the Pacific with the Atlantic Ocean. It has an interesting history. And it gives cruisers an up close view of massive locks in action. I recommend you sail during this period. It's the driest and best overall Panama Canal season. You risk being drenched in downpours. And humidity is uncomfortably high. Most cruise lines avoid sailing during this period - and you should, too. 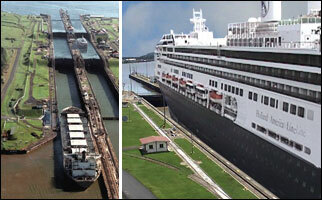 Some cruise lines begin their Panama Canal sailing seasons in this period. But heavy rains and high humidity could spoil your vacation. My advice: wait. Canal-only cruises are rare. Panama Canal cruises are almost always part of a multiple-destination cruise that include Caribbean (such as Aruba) and/or Pacific coast ports (like Acapulco). You completely pass through the Panama Canal, from the Atlantic to the Pacific side - or do the reverse. You visit ports on both coasts. This passage could be part of a New York to San Francisco cruise - or even a round-the-world cruise. Your cruise ship sails to Colon (see map below), then sails through the Gatun Locks to Gatun Lake. After some shore excursion opportunities (which could include a land day trip into the tropical rainforests or even a visit to Pacific side of the Panama Canal), your cruise ship backtracks to the Caribbean. These are essentially Caribbean cruises that dock in Colon as one of their Caribbean ports of call. From Colon, you take a shore excursion to view the Gatun locks.